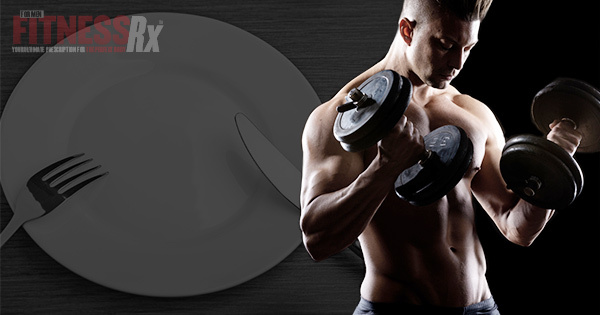 FitnessRX for Men > Nutrition > Tips > Intermittent Fasting To Burn Fat & Build Muscle? The ideal diet includes the adequate intake of high-quality foods that are full of essential vitamins and minerals without being too calorically dense. This type of diet enhances well-being by supporting the essential metabolic processes required for health while also helping to reduce body fat. Unfortunately, due to the overabundance of food today, the typical diet is loaded with calories – causing an epidemic rise in obesity and other associated diseases. As a result, there have been many diets throughout the years attempting to reduce body fat and promote health. Interestingly, a relatively new weight-loss approach involving intermittent fasting has been growing in popularity. This diet involves the consumption of roughly 600 calories per day for two days, combined with normal caloric consumption for the rest of the week. While the consumption of only 600 calories a day may sound a little nuts and scientific evidence regarding this approach is still limited3,4 preliminary findings indicate that intermittent fasting may be effective for weight loss. Moreover, intermittent fasting can also improve muscle growth by boosting the body’s response to the anabolic hormone insulin. The best way to reestablish leptin signaling is to reduce leptin production. One way to reduce leptin levels is to reduce body fat by reducing caloric consumption using intermittent fasting. This effect was clearly demonstrated in a study by Kroeger et al.,8 which showed that intermittent fasting caused a rapid decrease in circulating leptin levels. More specifically, the researchers showed that all subjects exposed to intermittent fasting for 10 weeks decreased bodyweight, on average, by eight pounds while also significantly reducing leptin levels. These findings suggest that fasting favorably reduces body fat, in part by reducing caloric consumption, while also reducing circulating leptin levels— which apparently reestablishes leptin sensitivity so that your brain can once again respond to leptin and reduce food consumption, further supporting lower body fat. Cardiovascular exercise is most valuable when the selective oxidation of body fat is maximized. Diet plays an important role in modulating this effect in response to endurance exercise. For instance, carbohydrate intake before and during exercise9 preferentially makes carbohydrate the fuel source while inhibiting the burning of fat. On the other hand, increased ingestion of fat10 stimulates energy production by fat oxidation while suppressing carbohydrate utilization. However, the consumption of high-fat foods will restore the fat expended during exercise, minimizing the loss of body fat. Another advantage not usually associated with caloric-lowering techniques – like intermittent fasting – is the improved capacity to build muscle. Probably because most assume that fasting only involves not eating. While intermittent fasting does involve reducing your food intake, it is only for a short period of time – which is followed by sufficient food consumption that causes the body to actually become more anabolic, with greater potential for muscle growth. The primary reason why this happens is that intermittent fasting, especially when combined with exercise, potently decreases intramuscular fat stores.14 This decrease of fat within muscle tissue enhances the muscle cell’s response to the extremely anabolic hormone insulin15, which drastically increases muscle protein synthesis, supporting greater muscle growth.16 Incidentally, although fasting for greater muscle growth might appear unorthodox, bodybuilders frequently use this biochemical approach to improve insulin sensitivity when carb-loading for a show, as carb-loading is preceded by carbohydrate depletion. This reduction in carbohydrate consumption reduces muscle glycogen and intramuscular fat stores, enhancing insulin function. The improvement of insulin function creates a greater response to the carb-reloading phase, ultimately boosting muscle glycogen levels for that fuller, more muscular look. In conclusion, the intermittent removal of food from the diet while fasting rapidly depletes the body’s preferred energy source, glycogen, prompting the body to switch to the more abundant energy source, fat. This switch to fat burning can promote the loss of body fat, particularly when fasting right before exercise. Moreover, fasting can also potentiate the muscle-building response to subsequent feeding by enhancing the potently anabolic hormone insulin. Altogether, the use of intermittent fasting to burn fat and promote muscle growth is a uniquely powerful way to improve your physique. Walker AR, and Wadee A. World-wide rises in obesity: minimal hopes of control. J R Soc Promot Health 2006; 126, 16-17. Mattson MP and Wan R. Beneficial effects of intermittent fasting and caloric restriction on the cardiovascular and cerebrovascular systems. J Nutr Biochem 2005; 16, 129-137. Harvie MN, Pegington M, et al. The effects of intermittent or continuous energy restriction on weight loss and metabolic disease risk markers: a randomized trial in young overweight women. Int J Obes 2011 (Lond); 35, 714-727. Williams KV, Mullen ML, et al. The effect of short periods of caloric restriction on weight loss and glycemic control in type 2 diabetes. Diabetes Care 1998; 21, 2-8. Northcott JM, Yeganeh A, et al. Adipokines and the cardiovascular system: mechanisms mediating health and disease. Can J Physiol Pharmacol 2012; 90, 1029-1059. Matsuzawa Y, Funahashi T and Nakamura T. The concept of metabolic syndrome: contribution of visceral fat accumulation and its molecular mechanism. J Atheroscler Thromb 2011; 18, 629-639. Harris RB, Bowen HM and Mitchell TD. Leptin resistance in mice is determined by gender and duration of exposure to high-fat diet. Physiol Behav 2003; 78, 543-555. Kroeger CM, Klempel MC, et al. Improvement in coronary heart disease risk factors during an intermittent fasting/calorie restriction regimen: Relationship to adipokine modulations. Nutr Metab 2012; (Lond) 9, 98. Arkinstall MJ, Bruce CR, et al. Effect of carbohydrate ingestion on metabolism during running and cycling. J Appl Physiol 2001; 91, 2125-2134. Burke LM, Angus DJ, et al. Effect of fat adaptation and carbohydrate restoration on metabolism and performance during prolonged cycling. J Appl Physiol 2000; 89, 2413-2421. Van Proeyen K, Szlufcik K, et al. Beneficial metabolic adaptations due to endurance exercise training in the fasted state. J Appl Physiol 2011; 110, 236-245. Hawley JA, Tipton KD and Millard-Stafford ML. Promoting training adaptations through nutritional interventions. J Sports Sci 2006; 24, 709-721. Achten J, Gleeson M and Jeukendrup AE. Determination of the exercise intensity that elicits maximal fat oxidation. Med Sci Sports Exerc 2002; 34, 92-97.
van Loon LJ, Koopman R, et al. Intramyocellular lipids form an important substrate source during moderate intensity exercise in endurance-trained males in a fasted state. J Physiol 2003; 553, 611-625. Larson-Meyer DE, Newcomer BR and Hunter GR. Influence of endurance running and recovery diet on intramyocellular lipid content in women: a 1H NMR study. Am J Physiol Endocrinol Metab 2002; 282, E95-E106. Hillier TA, Fryburg DA, et al. Extreme hyperinsulinemia unmasks insulin’s effect to stimulate protein synthesis in the human forearm. Am J Physiol 1998; 274, E1067-1074.